Are ankle and knee support braces helping or hurting me? 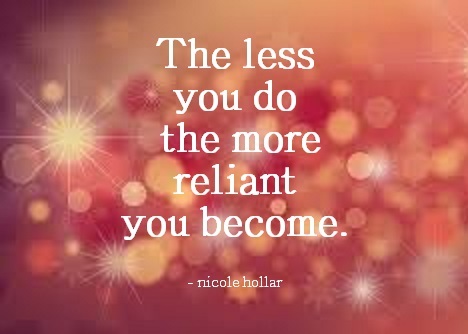 The less you do the more reliant you become. If you are considering using a support brace ask yourself why you need the brace – is it for warmth, stability, injury recovery? Are you just scared of rolling your ankle again? When it comes to knees and ankles routine stability, balance and strengthening are crucial. Braces are not a substitute. Too many times I’ve seen people bypass this ongoing process and shift right into wearing support braces. This is a mistake. People use braces for one of several reasons: 1. To assist in recent injury recovery, 2. A specific event where they need a little extra support, or 3. Long-term daily use during most common activities. 1. When it comes to injury recovery and basic daily function, yes, a brace is very helpful. Just after injury the individual is not likely at the re-strengthening part of recovery and is still managing the effects of the injury. Gradually over time, however, there should be a decline in support brace use and an increase in joint stability training. 2. Perhaps you’ve been training for a trail run or tennis match and want to wear a brace for extra security. No problem. In the case of the ankle it probably wraps under the foot, around the lower ankle and may even lace. And for the knee, you’ll see many neoprene braces with a cutout for the patella and plastic strips along the side. This style helps with proper knee tracking and provides a little extra support. There is nothing wrong with wearing the brace that is right for you. But I caution you to not over-train with it. The less our body does the more reliant it becomes. 3. The most common brace I see people using is the basic neoprene sleeve. It provides warmth and mild stability for both knees and ankles, and serves to warm the joint more than anything. These braces are most effective for people with joint inflammation who need extra warm up time. You may even own one of these or a brace that provides even more external support. In many cases the individual who desires to use a long-term brace has continual minor acute strains that scare him or her. This is likely a sign of greater mechanical problems and should be addressed as a system. In other words – are your muscles imbalanced, are your joints in alignment or are your muscles being forced to overwork to hold the joint together? Much like taping a broken pencil, if the pencil joint is not aligned then you will need extra or stronger tape to hold both halves of the pencil in the correct position, especially when you apply force. Though braces are great when really needed they can also hinder joint stability when overused. For daily activity and gym work you must allow your body to amplify its own strength, balance and stability. If you are unsure of what exercises to do I recommend consulting with a professional who will introduce you to balance, unilateral and stability exercises. These exercises should be part of a long-term training program. Nicole has been a leader in wellness and personal development since 2002 when she fell into fitness as a career. What she didn't understand then but quickly realized is that fitness is a gateway for people to stabilize their lives. Managing your workouts, your food, your health and your mindset are areas that we can all take control of. Nicole believes that fitness is a metaphor for life with its constant obstacles, challenges, triggers and successes. It is the physical expression of emotional, mental and spiritual development. We are all on a never-ending path of growth with obstacles to overcome, doors to walk to, through and from, and circumstances to teach us. Nicole's public speaking is focused on wellness and personal development. She also has a successful personalized fitness training studio in Fort Lauderdale that focuses on one-on-one private training, as well as personal development coursework and workshops.